The O.H. Hinsdale Wave Research Laboratory (HWRL), established at Oregon State University in 1972, is a state-of-the-art coastal engineering research and education center with two specialized large-scale resources for physical model testing of coastal systems subject to the action of tsunamis created by earthquakes and storm surge and waves created by wind storms. 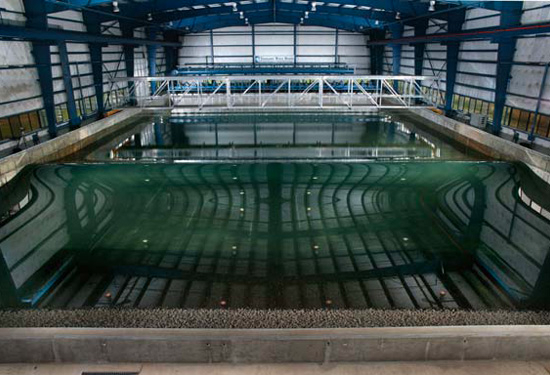 OSU was awarded an NSF grant to establish the Tsunami Experimental Facility at the HWRL as part of the Network for Earthquake Engineering Simulation (NEES) program from 2000 to 2004, and operated the NEES Tsunami Facility from 2004 to 2014. Over the past 10 years, the HWRL received several major upgrades, including state-of the art instrumentation, a large-stroke piston-type wavemaker, and over 465 m2 (5,000 ft2) of new office and meeting space for staff and visiting researchers. The NHERI Experimental Facility at Oregon State University, known as the NHERI Coastal Wave/Surge and Tsunami (NHERI CWST-EF), consist of two main resources to support a wide base of users: the Large Wave Flume (LWF) and the Directional Wave Basin (DWB). Both the flume and basin are capable of generating wind waves and tsunamis. The flume is a two-dimensional representation of the coast (looking directly out to sea), eliminating the complexity of longshore currents and wave direction and allowing a cross-section of test specimens to be studied at a large scale. The directional wave basin (DWB) increases the system complexity to three dimensions by extending laterally, allowing multifaceted specimens and generation of waves from a range of directions. In addition to these two resources, the Experimental Facility provides standard and state-of-the-art instrumentation to assess wave conditions, velocity, and response variables such as stress, strain, load and sediment transport (scour and erosion).